Bumthang, located in the eastern regions of Bhutan felt like a world away when I first arrived there on an evening, passing through many secluded villages, green fields, enchanting valleys and smiling people. If you feel that Bhutan is quiet and feels like you have traveled back in time, wait until you visit Bumthang. Blessed with nature’s abundance, Bumthang Valley allures its visitors with its enigma, shy and warm people. At least it did to me. 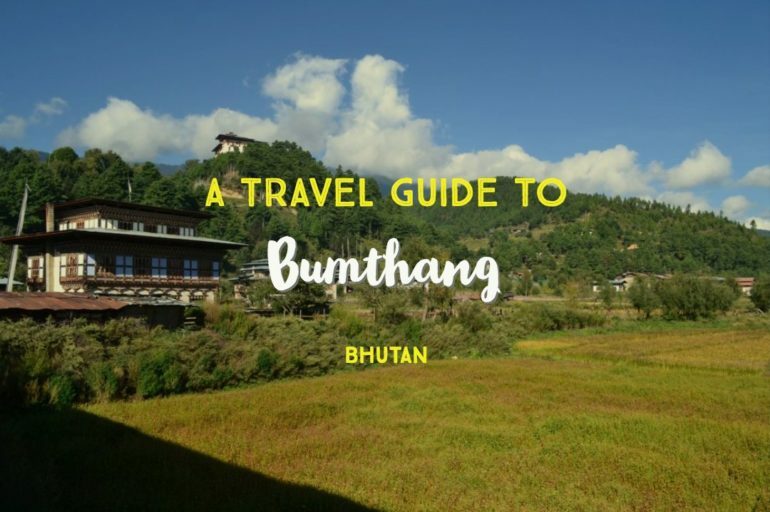 If you are traveling to Bhutan, Bumthang should be one of the must place to visit in Bhutan! 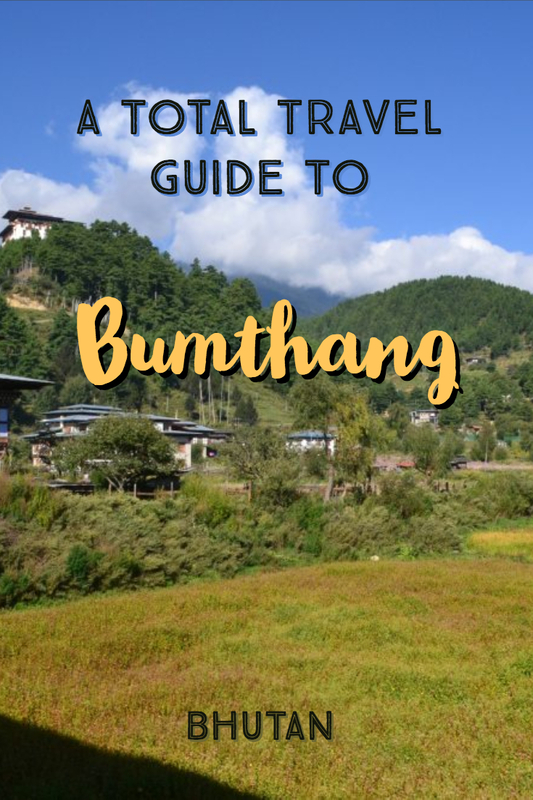 Here are what you can do in Bumthang Bhutan. A modern-day Shangri-La in eastern Bhutan, Bumthang in Bhutan consists of four main valleys – Chokhor, Tang, Chhume and Ura. Dotted with flourishing fields and farms consisting of wheat, rice, potatoes, apple and orange orchards, each valley is distinctly gorgeous. Most of the important monasteries and temples are located in Chokhor Valley, which is also the biggest of all these. Chokhor Valley is normally referred to as Bumthang itself and this valley consists of cottage industries where they produce cheese, honey, spirits, woollen work and more. These fertile valleys are covered in fields of buckwheat, rice and potatoes. Apple orchards and dairy farms are a common sight. Chokor Valley is home to Jakar, which is the capital of this region. The first thing that I loved about Bumthang is its serenity and its secluded location, which makes you feel like you are cut off from the rest of the world. This is felt throughout Bhutan but gets evident when you travel to the heart of the country. The numerous fields and temples are embedded with greenery and wild, colourful flowers, and there are a few people and even fewer tourists, which makes Bumthang special for travelers. What is the Best Time To Visit Bumthang Valley, Bhutan? 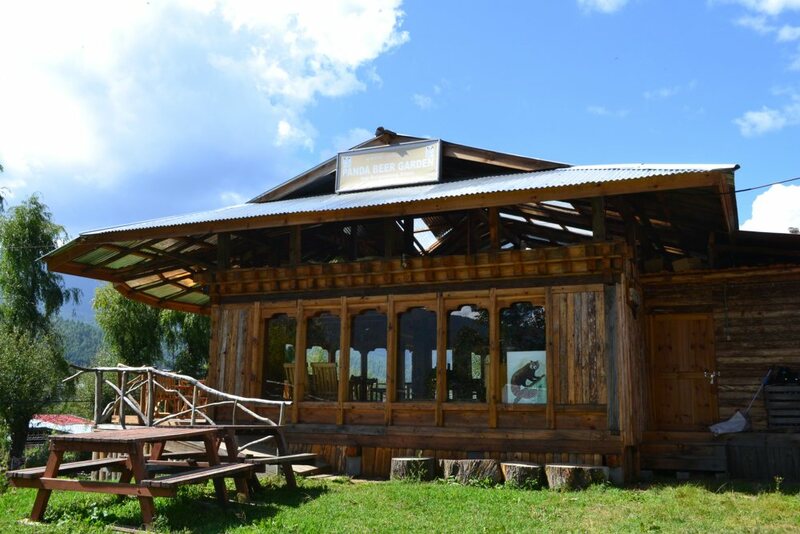 Where To Stay in Bumthang? The Kurje Lhakhang monastery is a popular destination and one of the important places to visit in Bumthang Valley. Located on the banks of the river, the complex consists of three temples. The first temple is built on a rock where Bhutan’s revered said Guru Rinpoche meditated. The second temple is built in a cave containing a rock with the imprint of his body. The third temple is the latest of all built by the Queen Mother. Serenity speaks volumes in the temple premises, which are surrounded by a beautiful 108-Chorten wall. Across the river from Kurje Lhakhang is Tamshing Lhakhang, a monastery known for its thousands of ancient religious paintings. 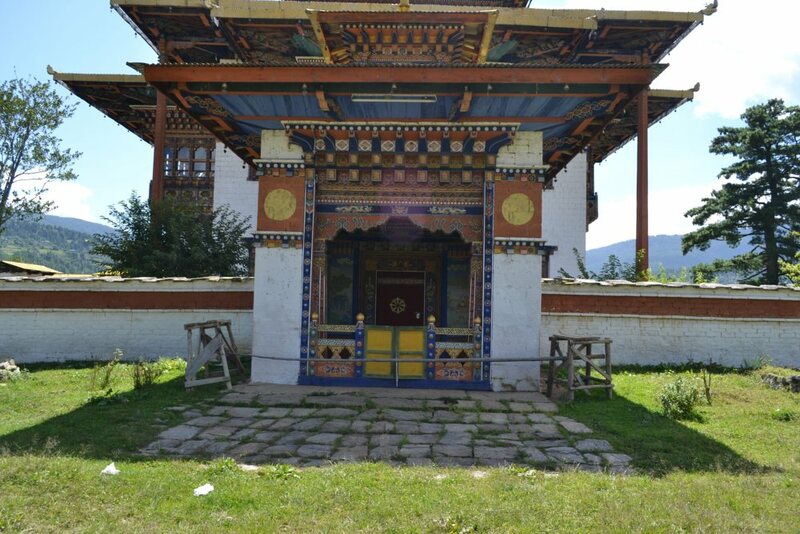 Constructed in 1501 by Guru Terton Pema Lingpa, this beautiful temple was restored in the 19th century, and most of the paintings, architecture and the artefacts of this monastery has been preserved well. One of the iconic structures of Bumthang is Jakar Dzong, which looks magnificent and is visible from very far across the valleys. Surrounded by lush greenery and hills, visit this Dzong for its sheer grandeur. It is now the place where the monks gather and reside. Jakar Dzong is used also as a building for administrative purposes. The Jambay Lhakhang’s legend is as interesting and lovely as the monastery itself is. In the 7th century, when Bhutan was ruled by Tibetan kings, one of the kings Songtsen Gampo ordered the construction of 108 monasteries to be built on a single day to suppress and ward away the evil spirits that were told be haunting this Himalayan region. One of the temples that were built includes Jambay Lhakhang, visiting which is considered auspicious by the locals even today. If you want to closely witness the Tibetan culture, then Lhodrak Kharchhu Monastery in Bumthang is the Dzong to visit. The monastery has played an important role since decades now in preserving Tibetan culture. Located away from the main town, about 3 km from Chamkhar, this monastery is home to more than 400 monks. They take part in chanting the daily prayers, learn Mask dances, draw and understand Dharma mandalas, learn the sacred rituals, practice ceremonial instruments and the art of making sacrificial objects. Overlooking the Chumey Valley at an altitude of 3600 meters lies Tharpaling Monastery. It is a good place to reach through a hike from Gyetsa village of Chumey valley which would take half an hour to reach. One of the ancient monasteries and among Bhutan points of interest, the monastery is an active centre for Nyingmapa sect of Buddhism where the principles are taught here. An annual prayer called Monlam here is a major event in the monastery, which attracts thousands of visitors. The Tharpaling Monastery complex consists of two temples, one on the ground floor consisting of the statues of the Buddhist deities, and the other on the first floor, which consists of intricate ancient paintings. There is also a huge assembly hall also adorned with colourful, bright murals depicting the legends, the history and the tales of Buddhism. If you are looking for a long and pleasant walk amidst the rich valleys of Bumthang, head to Tangbi Goemba during your visit to Kurje Lhakhang. A 30-minutes hike to the north of this monastery leads to this place built during the 14th century. The temple has two sanctuaries and a temple of terrifying deities. The sanctuary on the ground floor contains statues of past, present and future Buddha and three clay statues probably dating end of the 15th century. On the upper floor, the vestibule contains two remarkable paintings of Guru Rinpoche’s heaven and the Buddha Amitabh’s heaven. If you intend to hike even further, continue to visit Ngang Lhakhang, which is an ancient monastery built in the 15th century. This temple is known for its 3-days festival where mask dance performances are held as a part of the celebrations. Other smaller but worth visiting Dzongs in Bumthang include Chankhar Lhakhang, Konchogsum Lhakhang, Tang Rimochen Lhakhang and Peshiling Monastery. Bumthang region is home to two national parks, the Wangchuck Centennial Park in the north, and the Thrumshingla National Park in the south. Of these two, Wangchuck Centennial is Bhutan’s largest national park, consisting of a luxurious reserve forest comprising alpine meadows, major rivers and is home to rare species of Himalayan animals like the Himalayan black bear, snow leopard, wolf, the national animal of Bhutan – Takin and Tiger. Away from the main Chokor Valley or Bumthang town up north is Tang Valley, which can be reached through a 30-minute ride. You have to cross the Tang Chuu or Tang river by walking from here, and you know you have arrived in Tang valley when you have reached a higher elevation and rows of prayer flags welcome you. Unlike the main region of Bumthang, sheep rearing is the means of livelihood for the people here as full-fledged cultivation is not possible at this altitude. This region consists of a monastery dedicated to Guru Pema Lingpa who was born here. It also is home to Ugyenchholing Palace and the Burning Lake. Once a residence of the former king Ugyenchholing, Ugyenchholing Palace located in Tang valley is now a unique family museum, which was restored in the 19th century. The artefacts and the collections tell the tales of the local rulers and Bumthang’s culture and Bhutan’s history. A holy site to the Bhutanese, Mebar Tso located in Tang valley is a lovely lake surrounded by nature. As the legend goes, this is the place where Guru Pema Lingpa found the treasure of the Lama Rinpoche, where he was guided by his dream to find it here in Mebar Tso Lake. Prayer flags surround this lake today, where the locals and the Buddhists come here to take the blessings and to get influenced by the positive vibes of this place. 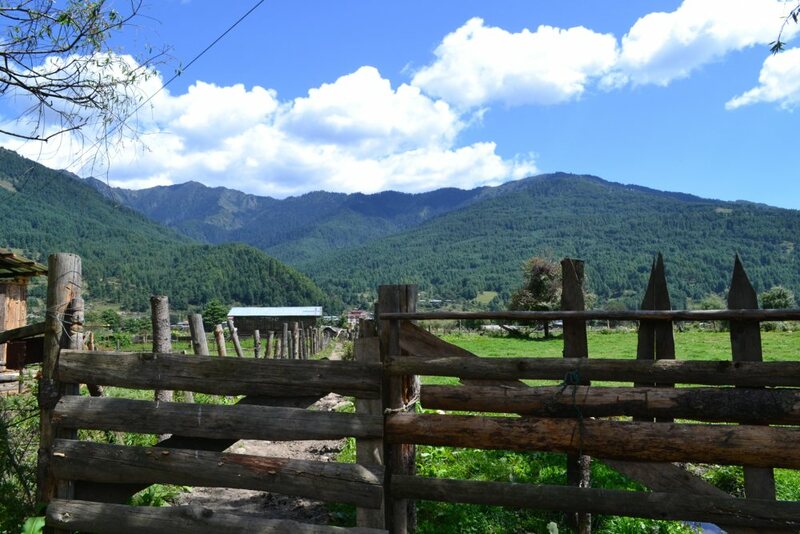 The quaintest and the most traditional valleys of Bumthang is the Ura Valley, located about 50km from Jakar. The 1.5-hours drive to the valley is blissful, as the road takes you through the best views of the valley laden with pastures over which sheep can be found grazing in herds. As you pass through to a higher elevation, you can get a stunning view of Mount. Gangkhar Puensum. This valley has uniquely built houses that come in groups, and people here keep for themselves mostly. 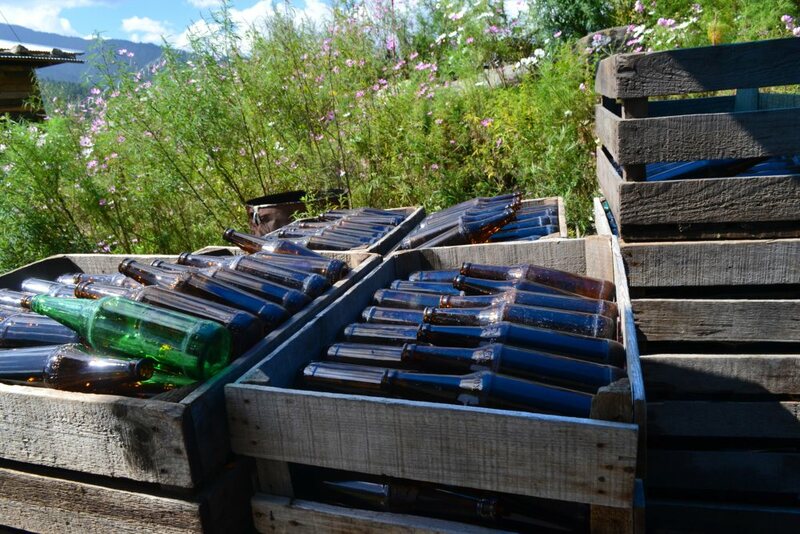 Visiting the beer factory should be one of the important highlights of your Bumthang sightseeing. Red Panda, the lager beer of Bhutan is manufactured in Bumthang. If you are looking for any modern brewery, be prepared to be surprised! This brewery is actually in a huge house made of wood, where rows of wooden barrels are placed. There is a picturesque Beer Cafe adjacent to the factory, where you can taste the fresh beer. You can attend the guided Beer tasting tour where you get to see how the Red Panda is made. Known for the owl’s howling at night, this 3-day trek gets it name from the owls, but the destination is to Tharpaling Monastery. This trek around Bumthang offers fantastic views of a diverse flora and fauna consisting of maple, apple and pine orchards, bamboos. You come across many ancient Buddhist temples and monasteries. If you are trekking here during spring, you will be welcomed by a vibrant valley of flowers dominated by varieties of rhododendrons. This tranquil valley eventually opens to magnificent views of Mt. Gangkar Puensum, the highest unclimbed peak in the world. 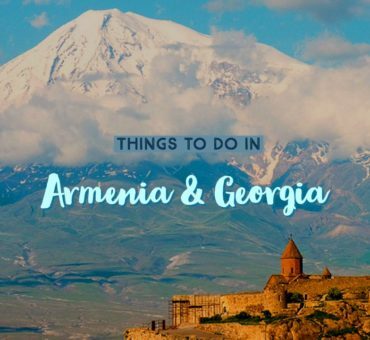 If possible, schedule your trek during one of the above local festivals to enjoy the traditions and culture of this region. Bumthang is referred to as the cultural capital of Bumthang, and hence the name Bumthang Cultural Trek. The cultural trek in Bumthang is a short and easy trek where you encounter the gorgeous views of the valleys of Bumthang. 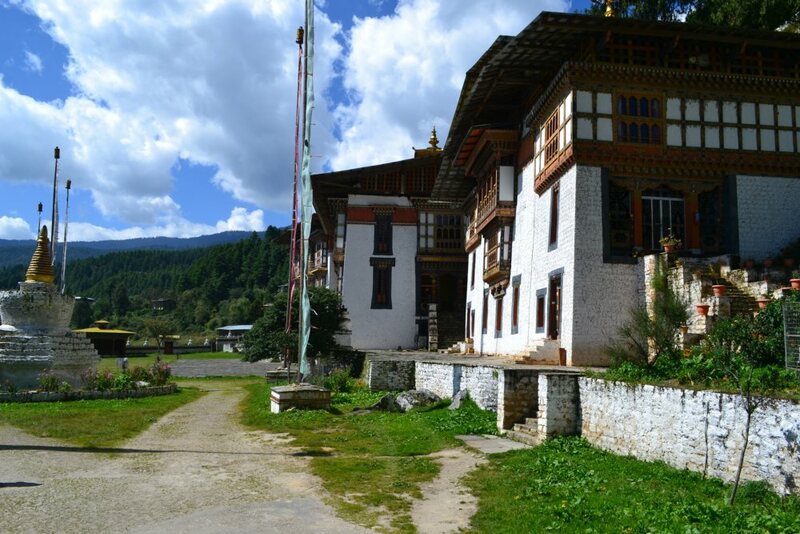 You pass through the best countryside of Bumthang visiting some ancient monasteries. 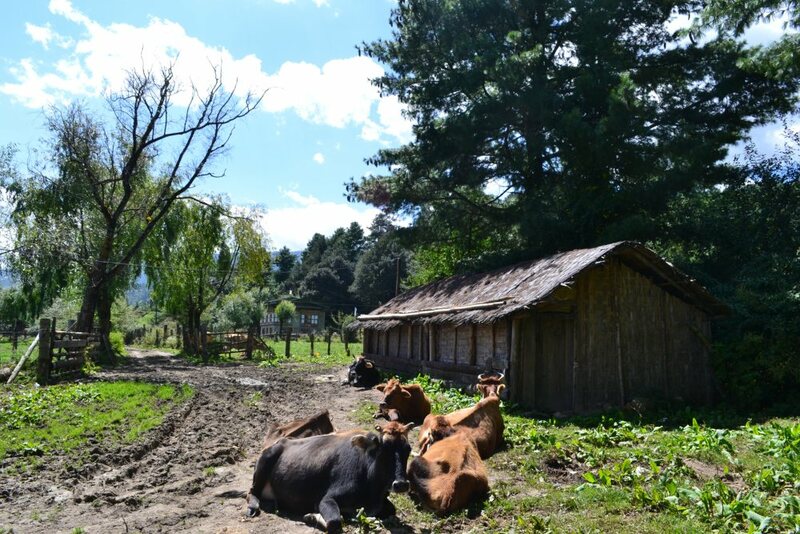 It offers a chance to see the rural Bumthang with its unique homes, small factories, abundant flora and fauna surrounded by the snow-capped Himalayan peaks. Wild East Rodung La Trek is a low altitude trek done best during the spring or during early winter between March to May or October & November. It takes typically 10 days to complete the trek. 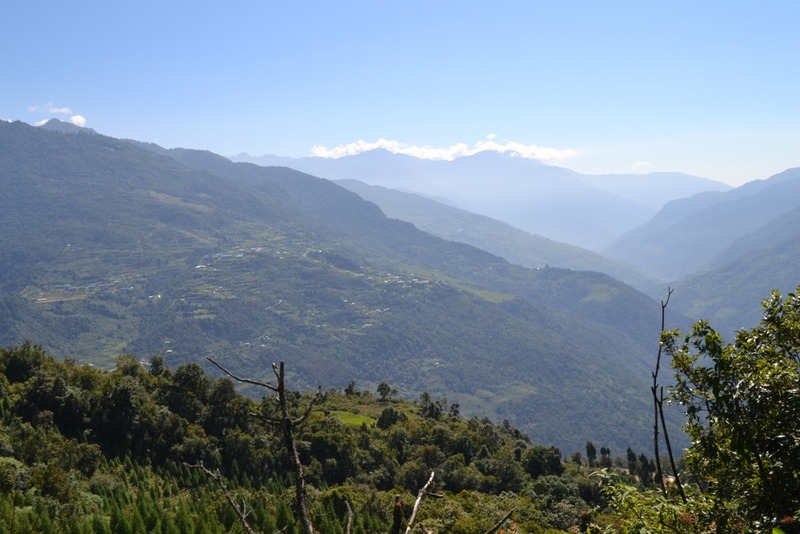 Although it is easy altitude wise, it is a moderate trek that requires some fitness. The trail takes you from Bumthang to Trashiyangtse in the far eastern reaches of the kingdom, where you’ll see almost all the attractions of Bumthang. Once an important trade route between central and eastern Bhutan towns and villages, now it is a spectacular trail that passes through bamboo and alpine meadows, many beautiful passes, villages and monasteries. Itinerary: Jakar – Ngang Lhakhang – Ugenchholing – Phokpey – Pemi – Khaine Lakhang – Tangmachu – Menji – Pemi – Taupang – Trashiyangtse. If you want to witness the local festivals to get an insight of Bhutan’s rich culture, festivals are the way to go. There are at least 5 festivals that happen in Bumthang itself, so you might want to plan your trip around these for a splendid experience! These are the festivals in Bumthang. Celebrated in eastern Bhutan region of Bumthang, Ura Yakchoe is a traditional local festival dedicated to a Lama who is worshipped for seeking blessings. According to the legend, the Lama visited a woman’s home and asked for water, and when she appeared with water there was no sign of the Lama but instead found a statue. It has been passed down for many generations and people worship it during Ura Yakchoe in the form of dance performances in the Ura Valley in Bumthang. The festival takes place in the Chokhor Valley at Kurjey Lhakhang in Bumthang and is similar to the others that are celebrated in the rest of the country dedicated to Guru Rinpoche, whose imprint is present in the temple. Celebrated at Tamzhing Lhakhang in central Bhutan in Bumthang, Tamzhing Phala Choepta festival is one of the important festivals in that region. It is celebrated by the Nyingma sect of Buddhists and is dedicated to the 15th century Lama Pema Lingpa. This festival is also characterized by mask dance and cultural festivities. It is believed that attending this festival wards off evil spirits, brings good luck and prosperity. Held in Nimalung Dratshang in Bumthang, the Nimalung Festival is a 3-days event which is celebrated with grandeur in the town. Elaborate traditional murals are worshipped during this festival where many mask-dance performances also take place. If you want to see the nomadic people of the North West and North East Himalayas, attend the Nomad festival in Bumthang. The nomads perform unique shows involving various dance performances, plays and rituals that depict their culture and tradition, which is quite unheard of by the outside world. The colourful outfits, flags, and the decorations mark the festival’s highlights. This festival gives a peek into the nomad’s life. Bumthang enjoys almost the same temperature has the western region of Bhutan, but the winter is extreme with longer and colder nights. Bumthang’s altitude is not much high at 2800 meter (Chokor Valley) but the valleys overall have regions with higher altitudes as you move to other valleys of Bumthang. Bumthang has two best seasons ideal for visiting. One is the spring from March to May, just before the onset of the monsoon, which is a great period for treks. The other season is the fall from late September to late November, which is a good time to attend all the festivals. The nights get colder as November approaches, though. 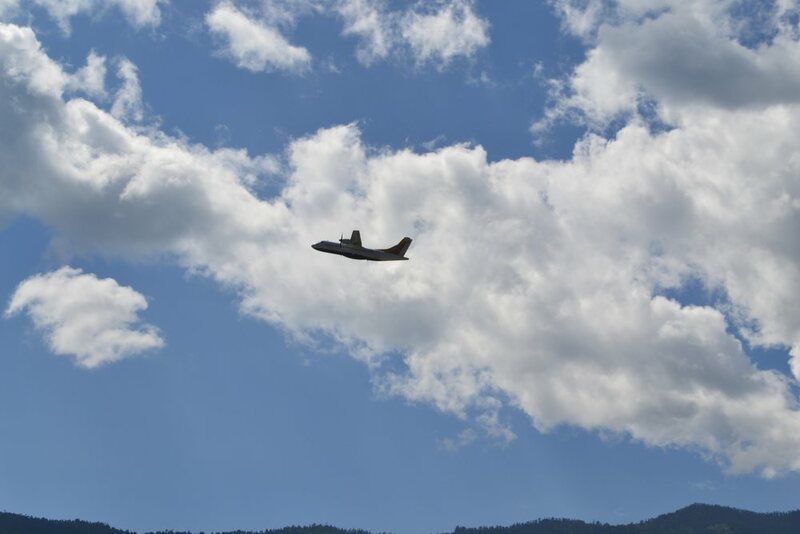 Flights to Bumthang: There is an airport in Bumthang. You can fly from Paro or certain cities. This is the most expensive option of course. 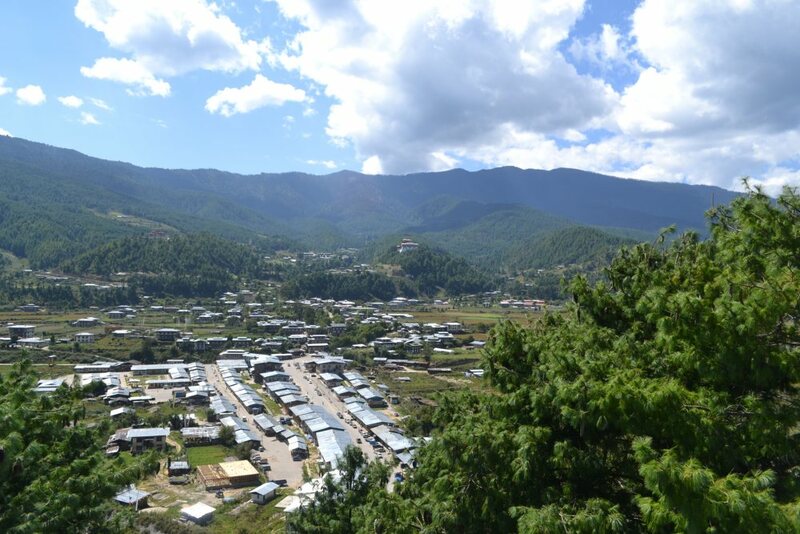 By road from Thimpu/Paro: Bumthang to Thimpu distance is about 270km. It takes 9 to 10 hours to reach from Thimpu to Bhutan by cab. The public transport is very limited to these areas from Thimpu. There is just one bus that leaves at 8 AM in the morning every day from Thimpu bus stand, which will take you to Bumthang at around 8 PM in the evening. Opting for cabs is another option, which is also ideal if you are traveling in groups. Although cab is a comfortable option it can get expensive if you are traveling alone. 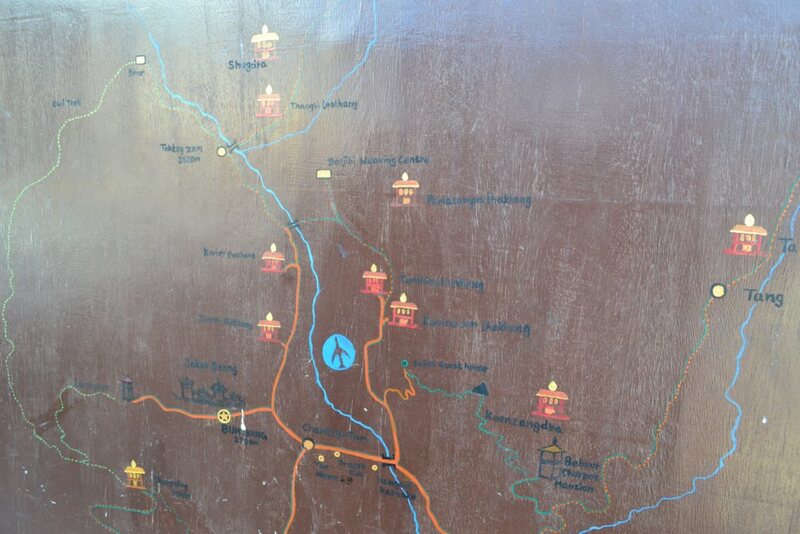 Once you arrive at Bumthang, you can get a copy of Bumthang map in any of the shops on the main street, which you can use for your reference. 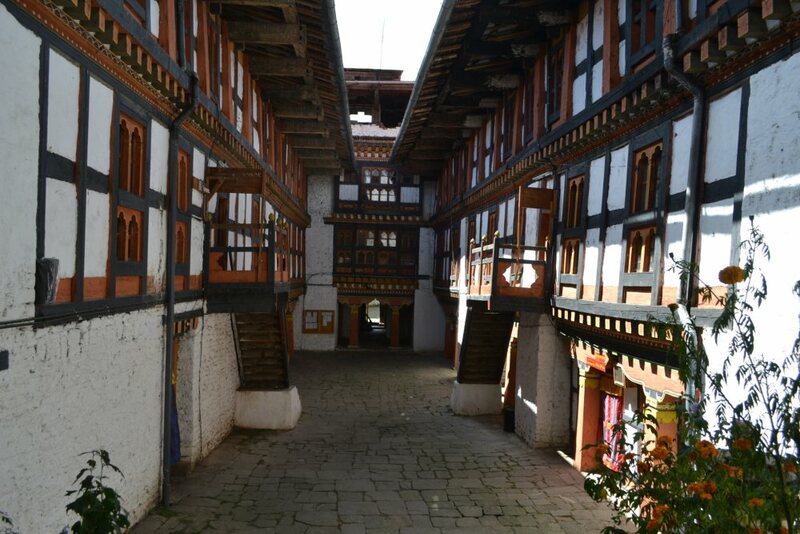 Bumthang has all type of accommodation options although the town itself is not very big. There are quite a few hotels in Bumthang. You can also directly walk into the many guest houses and homestays during the offseason and book your place. You can book or check the hotels online on this website dedicated to hotels in Bhutan. 1. Bumthang has valleys that range from 2000 meters to over 4000 meters, which means you might encounter problems with mountain altitude. So keep your medications ready, especially if you are trekking. 2. If you are traveling from October to December, the weather can be chilly, which drops to minus temperatures at night. So bring enough clothes to keep warm. 3. 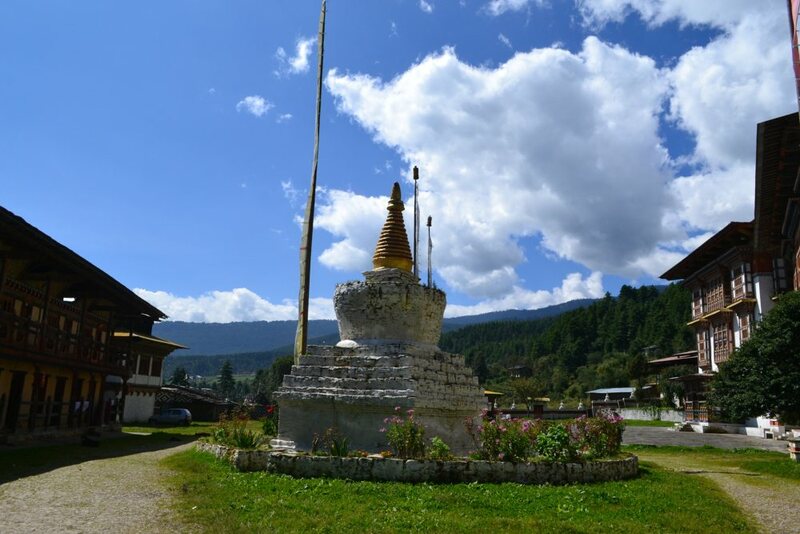 It is better to book a cab if you are traveling in groups to check out Bumthang’s attractions. But if you are fit, it is best to explore Bumthang on foot, as walking is a great way to see the countryside of Bumthang up close. 4. The hotels can be full during the festivals since there aren’t too many of them. So it is better to book ahead during the peak seasons. 5. As for the treks, it is better to do in groups and with a guide since wild bears are a common occurrence in these trails, and the paths can be dangerous or tricky. Share Love. Pin this post!